Advances in high-throughput technologies and bioinformatics have transformed gene expression profiling methodologies. The results of microarray experiments are often validated using reverse transcription quantitative PCR (RT-qPCR), which is the most sensitive and reproducible method to quantify gene expression. Appropriate normalisation of RT-qPCR data using stably expressed reference genes is critical to ensure accurate and reliable results. Mi(cro)RNA expression profiles have been shown to be more accurate in disease classification than mRNA expression profiles. However, few reports detailed a robust identification and validation strategy for suitable reference genes for normalisation in miRNA RT-qPCR studies. We adopt and report a systematic approach to identify the most stable reference genes for miRNA expression studies by RT-qPCR in colorectal cancer (CRC). High-throughput miRNA profiling was performed on ten pairs of CRC and normal tissues. By using the mean expression value of all expressed miRNAs, we identified the most stable candidate reference genes for subsequent validation. As such the stability of a panel of miRNAs was examined on 35 tumour and 39 normal tissues. The effects of normalisers on the relative quantity of established oncogenic (miR-21 and miR-31) and tumour suppressor (miR-143 and miR-145) target miRNAs were assessed. In the array experiment, miR-26a, miR-345, miR-425 and miR-454 were identified as having expression profiles closest to the global mean. From a panel of six miRNAs (let-7a, miR-16, miR-26a, miR-345, miR-425 and miR-454) and two small nucleolar RNA genes (RNU48 and Z30), miR-16 and miR-345 were identified as the most stably expressed reference genes. The combined use of miR-16 and miR-345 to normalise expression data enabled detection of a significant dysregulation of all four target miRNAs between tumour and normal colorectal tissue. Our study demonstrates that the top six most stably expressed miRNAs (let-7a, miR-16, miR-26a, miR-345, miR-425 and miR-454) described herein should be validated as suitable reference genes in both high-throughput and lower throughput RT-qPCR colorectal miRNA studies. Mi(cro)RNAs are short RNA molecules that bind (generally) to 3' UTR sequences of target messenger RNAs (mRNAs), thereby modulating their expression patterns. This modulated gene expression is manifest either as translational repression , or mRNA degradation whereby the RNA interference pathway is initiated to remove targeted sequences . MiRNAs play major roles in governing diverse biological processes such as differentiation, proliferation, and apoptosis [3, 4]. Individual miRNAs have been ascribed oncogenic and tumour suppressor functions , and aberrant miRNA expression has been implicated in many malignancies, including colorectal cancer (CRC) [6, 7]. Previous study demonstrated that miRNA profiles may be more accurate in disease classification than mRNA profiles . Moreover, miRNAs have been associated with CRC pathogenesis [9, 10], microsatellite stability status [11, 12], therapeutic outcome and prognosis [12–15]. High-throughput technology such as microarrays enables simultaneous quantification of hundreds of miRNAs in a single RNA sample. Meaningful interpretation of such large datasets has been made possible by recent advances in bioinformatics. It is critical that the findings of microarray screening methodologies are validated to produce scientifically robust results, using the most sensitive and reproducible method of gene expression quantitation, reverse transcription quantitative PCR (RT-qPCR) . In order to achieve accurate, reproducible and biologically relevant miRNA RT-qPCR data, non-biological sample-to-sample variation that could be introduced by protocol-dependent inconsistencies has to be corrected for by using reference genes. Use of unreliable reference genes for normalisation may lead to inaccurate quantitation of miRNAs of interest [17, 18]. Previous studies have demonstrated that a single universal reference gene for all tissue types is unlikely to exist [19–23], and the use of a single reference gene for normalisation leads to large errors and is therefore inappropriate [22, 24]. Despite increasing miRNA expression studies in CRC, no previous report detailed a robust identification and validation strategy for suitable reference genes for normalization. The aim of this study was to identify the most stable reference genes using a high-throughput approach, in ten pairs of stage II colorectal tumour and normal tissues. Following TaqMan array card analysis and the established approach of finding miRNAs whose expression pattern is similar to the global mean expression , miR-26a, miR-345, miR-425 and miR-454 were identified as the most stably expressed miRNAs. The stability of these miRNAs was further assessed by RT-qPCR in 74 colorectal tissues with an expanded panel of candidate reference miRNAs (let-7a, miR-16) and two small nucleolar RNAs (snoRNAs, RNU48 and Z30). Well established oncogenic miRNAs in CRC: miR-21 [7, 13, 26] and miR-31 , and tumour suppressor miRNAs: miR-143 [6, 27, 28] and miR-145 [6, 7, 12, 27] were used as target miRNAs to determine the effect of reference gene choice on relative quantitation. Primary colorectal tissues consisting of 35 tumour specimens and 39 normal tissues were obtained from 40 patients undergoing surgical resection or diagnostic endoscopy at Galway University Hospital, Galway, Ireland. High-throughput miRNA profiling was performed on ten pairs of corresponding tumour and normal tissues from patients with stage II CRC , and these form part of the subsequent validation cohort. Tissue samples were immediately snap-frozen in liquid nitrogen following retrieval and stored at -80°C. Written informed consent was obtained from each patient and the study was granted approval by the Clinical Research Ethics Committee of Galway University Hospital. Clinicopathological data was collected prospectively and is summarised in Table 1. AJCC, American Joint Committee on Cancer; pCR, pathologic complete response following neoadjuvant therapy. To isolate small RNA (<200 nucleotides), approximately 100 mg of tissue was homogenised using a bench-top homogeniser (Polytron PT1600E, Kinematica AG, Lucerne, Switzerland) in 1-2 mL of Qiazol (Qiagen, UK). Subsequent miRNA extraction was performed using the RNeasy Mini Kit and the RNeasy MinElute Cleanup Kit (Qiagen) according to the manufacturer's instructions. Concentration and purity of miRNA was assessed using the Nanodrop 1000 spectrophotometer (Nanodrop Technologies Inc., USA). Qualitative analysis of miRNA was performed using the Agilent 2100 Bioanalyzer and the Small RNA Assay (Agilent Technologies, USA) to determine the percentage of miRNA in the small RNA fraction. A TaqMan Human MicroRNA array card is a high throughput PCR-based miRNA array that enables analysis of 384 miRNA assays on a microfluidic card. Each card contains a mammalian U6 assay repeated 4 times, and an assay unrelated to any mammalian species ath-miR-159a to provide a process control. Simultaneous synthesis of cDNA for mature miRNAs was performed using Megaplex Reverse Transcription Human Pool A (Applied Biosystems), which is a set of pre-defined pools of 380 stem-looped reverse transcription primers. RT-qPCR was performed using the Applied Biosystems 7900HT Fast Real-Time PCR System, and default thermal-cycling conditions. First strand cDNA was synthesised using gene-specific stem-loop primers. The primer sequences of let-7a and miR-16 have been previously described . Primers were obtained from MWG Biotech (Ebersberg, Germany) if sequences were available. Otherwise, assays containing stem-looped primer were purchased from Applied Biosystems. All reagents were included in the High-Capacity cDNA Reverse Transcription Kit (Applied Biosystems). The reaction was performed using a GeneAmp PCR system 9700 thermal cycler (Applied Biosystems) with samples incubated at 16°C for 30 minutes, 42°C for 30 minutes and 85°C for 5 minutes. An RT-negative control was included in each batch of reactions. The PCR reactions were carried out in final volumes of 20 μL using the Applied Biosystems 7900HT Fast Real-Time PCR System. Reaction mix consisted of 10 μL 2 × TaqMan Fast Universal PCR Master Mix, No AmpErase UNG, 1 μL 0.2 μM TaqMan probe, 3 μL 1.5 μM of forward primer, 1.4 μL 0.7 μM reverse primer, and 1.33 μL of cDNA. The PCR reactions were initiated with 10 minutes incubation at 95°C, followed by 40 cycles of 95°C for 15 seconds and 60°C for 60 seconds. Inter-assay control and calibrator were included in each 96-well plate. All reactions were performed in triplicate. The threshold standard deviation for intra- and inter-assay replicates was 0.3. PCR amplification efficiencies were calculated for each candidate reference gene assay using the formula E = (10-1/slope - 1) × 100, using the slope of the plot of quantification cycle (Cq) versus log input of cDNA (10-fold dilution series). PCR amplification efficiencies for each candidate reference gene are shown in Table 2.
rRNA, ribosomal RNA; snoRNA, small nucleolar RNA; E, amplification efficiency. High throughput data generated from TaqMan array card RT-qPCR was analysed using qbasePLUS software (Biogazelle, Belgium) . Average values of triplicate Cq values were converted to relative quantities for NormFinder and geNorm analysis [21, 32]. 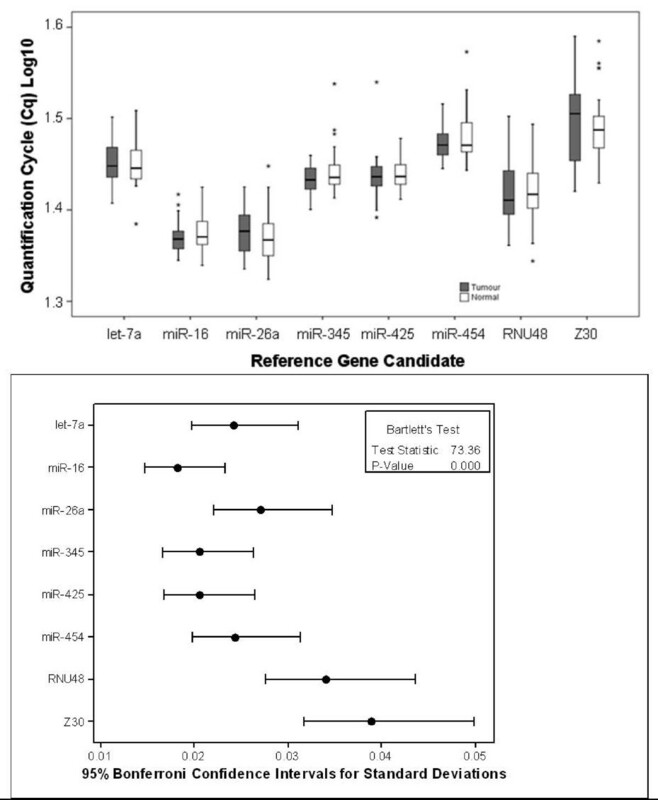 The relative expression of target miRNAs (miR-21, miR-31, miR-143 and miR-145) normalised to one or more reference candidates was also determined using qbasePLUS software employing a generalised and universally applicable quantification model based on efficiency correction, error propagation and multiple reference gene normalisation . Statistical analysis was performed using SPSS 14.0 (Chicago, IL, USA) and Minitab® 15 softwares (Minitab Ltd, Coventry, UK). Distribution of continuous data was determined using the Kolmogorov-Smirnov Z test. Two-sample t test was used to compare log 10 Cq values of candidate reference genes, and log 10 relative quantities of target miRNAs between tumour and normal tissues. The equivalence test was used to determine if reference genes were equivalently expressed between tumour and normal tissues . Difference in variance between genes was assessed using Bartlett's test. P values of less than 0.05 were considered statistically significant for all tests. We profiled a panel of 380 miRNAs and controls in 10 pairs of stage II colorectal tumour and normal tissues. To identify the most stably expressed miRNAs, a robust global mean expression normalisation strategy was applied . For each individual sample, the mean Cq values of all miRNAs that were expressed, and those that were expressed below cycle 35 were calculated. Expression stability of the mean global values, the geometric means of snoRNAs (U6, RNU44 and RNU48) and miRNAs (let-7a, miR-16, miR-17 and miR-103) were assessed using the GeNorm algorithm. Both the geometric mean of let-7a and the mean global expression values for all miRNAs were found to be the most stably expressed. U6 RNA was the least stably expressed reference gene. Four miRNAs that showed an expression profile closest to the mean were miR-26a, miR-345, miR-425 and miR-454. Two snoRNA genes (RNU48 and Z30) and one other miRNA (miR-16)  were chosen for further validation in a larger cohort. Known functions of the candidates are listed in Table 2. RT-qPCR was performed to further evaluate the expression patterns of eight candidate reference genes in a cohort of 74 colorectal tissues. The reference genes displayed a wide range of Cq values ranging from 21.09 to 38.90. MiR-16 and miR-26a showed relatively high expression with mean Cqs of 23.61. Candidates that were moderately abundant with mean Cqs between 26 and 28 were let-7a, miR-345, miR-425 and RNU48. Z30 and miR-454 were the least expressed with mean Cqs of above 30. 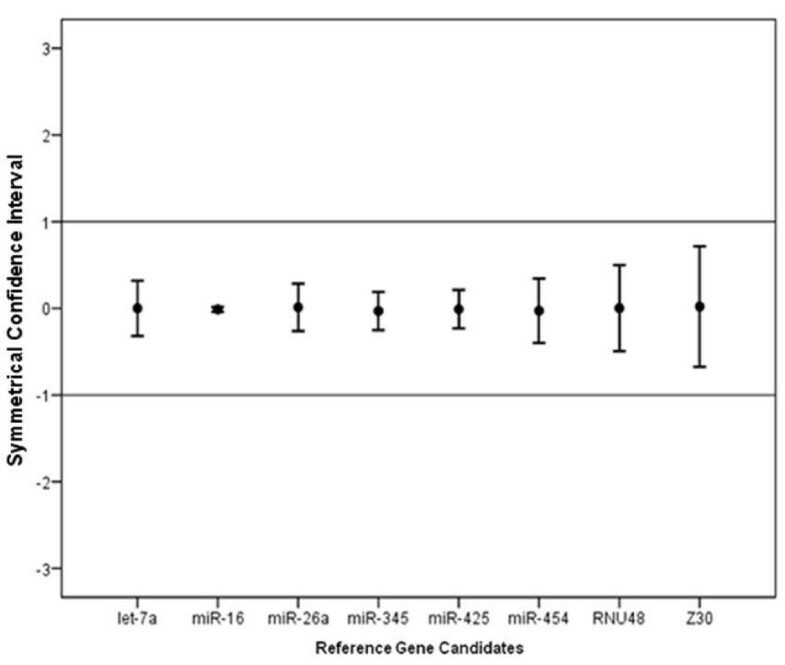 Among the reference genes, miR-16 showed the least variability while Z30 displayed the most. Mean and range of Cq values for all reference genes and target miRNAs are shown in Table 3. Using the Cq values of each reference gene, there was no evidence for differential expression of all of the candidate reference genes between tumour and normal tissues (p > 0.05; Figure 1a), thus supporting further evaluation of these candidate reference genes. 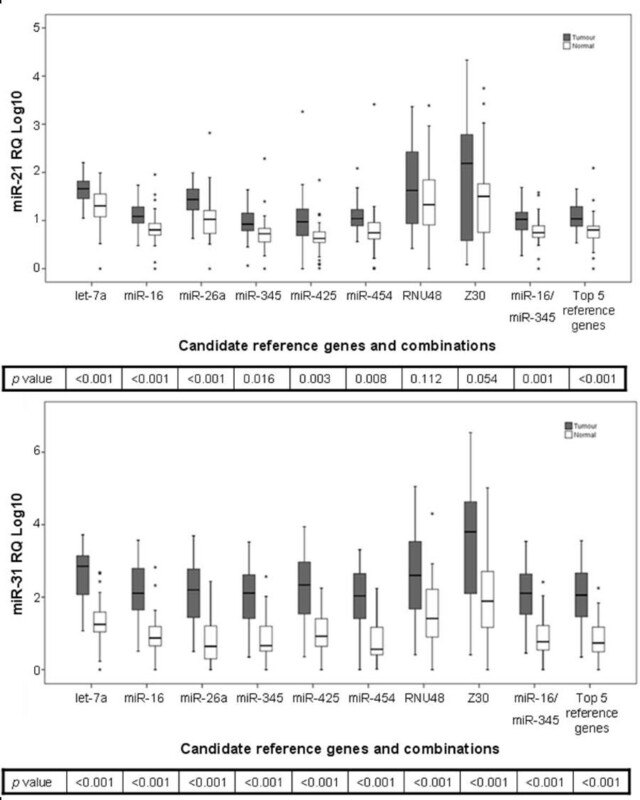 A significant difference in variance between reference genes (p < 0.001; Figure 1b) indicated differing stabilities of these candidates. The equivalence test confirmed that all reference genes were equivalently expressed between tumour and normal colorectal tissues (Figure 2). Logarithmised relative expression values of candidate reference genes were calculated and expressed as means and matching symmetrical confidence intervals. Confidence intervals of between -1 and 1 correspond with fold change of ≤ 2, whereas confidence intervals of between -1.58 and 1.58 correspond with fold change of ≤ 3. A fold change cut-off of 3 was used as previously demonstrated . The upper border of the confidence interval of > 1.58 indicates higher expression of a gene in tumours; whereas the lower border of the confidence interval of < -1.58 indicates higher expression of a gene in normal tissues. 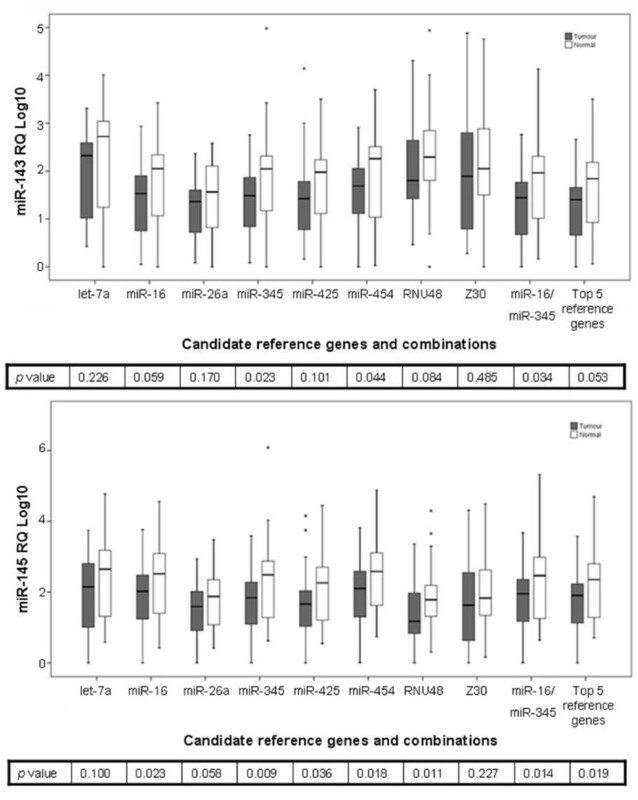 Relative quantity and variation associated with each candidate reference gene. (a) Quantity of candidate reference miRNAs in colorectal tumour (n = 35) and normal (n = 39) tissues as expressed as quantification cycle (Cq) values. Boxplots depict median lines, interquartile-range boxes and outliers (*). Error bars represent range of values. No significant difference (p > 0.05, t-test) was found within all reference genes between tumour and normal tissues, thus supporting further evaluation of these genes as references. (b) Variation associated with each candidate reference gene. There was a significant difference in variance (p < 0.001, Bartlett's test) associated with each reference gene indicating differing stabilities. RNU48 and Z30 showed greater variance than miR-16, miR-345 and miR-425. Equivalence test for candidate reference genes. Each line indicates the difference in logarithmic (base 2) expression level between tumour and normal tissues, with the upper and lower bars representing the upper and lower limits of symmetrical confidence intervals respectively. All genes were equivalently expressed with confidence intervals within fold change of 2 (deviation area 1, -1). 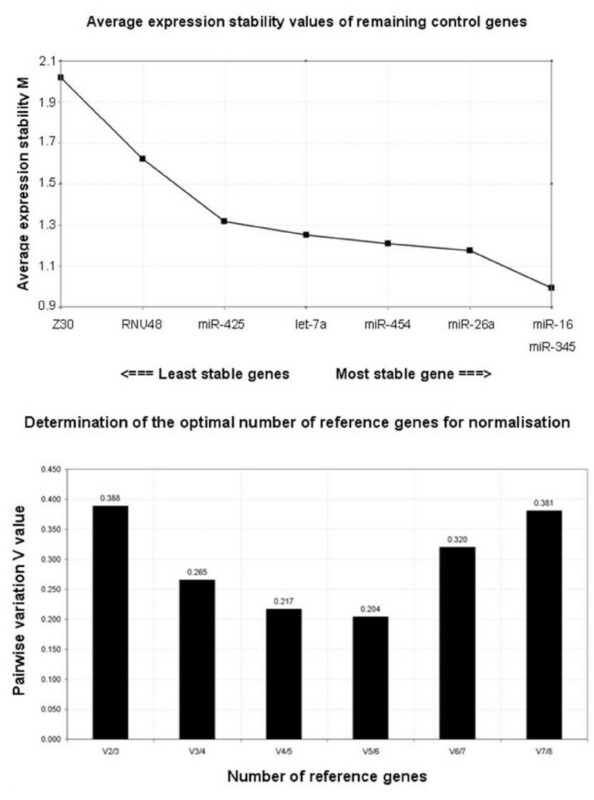 Variable stability of reference genes was further assessed using two algorithms: NormFinder  and geNorm . The ranking of genes as determined by these programs is summarised in Table 4. Lower stability values characterise greater gene stability. GeNorm generates a gene stability value (M) based on the average pairwise variation between all tested genes accompanied by stepwise exclusion of the least stable gene (Figure 3a). It also generates V values (V) which define the pairwise variation between two sequential normalisation factors to determine the optimal number of reference genes for normalisation (Figure 3b). NormFinder and geNorm identified miR-345 and miR-16 respectively as the most stably expressed reference genes. Consistent with the results from the TaqMan array card using the mean expression values, let-7a, miR-26a, miR-345, miR-425 and miR-454 were identified as five of the six most stably expressed genes in the validation dataset. Both programs selected miR-16 and miR-345 as the most stable pair of reference genes. GeNorm recommended the use of five of the six most stable genes for optimal normalisation, in line with previous reports that indicate intrinsic higher variability in cancer biopsies. Interestingly, miRNAs identified to be the most stably expressed in stage II tumour and normal tissues using high-throughput methodology remained consistently stably expressed in a larger tissue cohort consisting of tissues of varying stages. GeNorm analysis of candidate reference genes. (a) Ranking of candidate reference genes according to average expression stability. The least stable genes with the highest stability measure, M were excluded in a stepwise manner until the two most stable genes remained: miR-16 and miR-345. (b) Determination of optimal number of reference genes for normalisation. The GeNorm programme calculates a normalisation factor (NF) which is used to determine the optimal number of reference genes required for accurate normalisation. This factor is calculated using the variable V as the pairwise variation (Vn/Vn + 1) between two sequential NFs (NFn and NFn + 1). The number of reference genes is deemed optimal when the V value achieves the lowest, at which point it is unnecessary to include additional genes in the normalisation strategy. In this instance, the GeNorm output file indicated that optimal normalisation of gene expression could be achieved using the top five most stable reference genes. Of the four target miRNAs evaluated after normalisation to different references, the choice of reference gene did not influence the relative quantity of miR-31 (p < 0.001) between tumour and normal tissues suggesting a highly significant differential expression of miR-31 in CRC (Figure 4b). Relative quantities of target miRNAs in tumour and normal tissues using different normalisers are shown in Figure 4 and Figure 5 with p values indicated in the box. When a single gene was used as a reference gene, only miR-345 and miR-454 detected significant difference between tumour and normal tissues in all four miRNAs. The combination of miR-16 and miR-345 detected significant up-regulation of miR-21 (p = 0.001), miR-31 (p < 0.001), and down-regulation of miR-143 (p = 0.034) and miR-145 (p = 0.014). These results highlight the importance of selecting appropriate and validated reference genes. Despite the large sample size, true biological differences in gene expression were not detected when using less stable reference genes for normalisation. Effect of reference gene choice on relative expression of oncogenic target miRNAs in colorectal tumour (n = 35) and normal (n = 39) tissues. Boxplots depict median lines, interquartile-range boxes and outliers (*). Error bar represent range of values. Relative expression of oncogenic miRNAs: (a) miR-21 and (b) miR-31 between colorectal tumour and normal tissues normalised to different reference genes with p values indicated. The use of the two most stable reference genes: miR-16 and miR-345 detected significant dysregulation both target miRNAs between colorectal tumour and normal tissues. Dysregulation of miR-31 was observed regardless of the choice of reference indicating that it's highly differentially expressed in colorectal cancer. Effect of reference gene choice on relative expression of tumour-suppressor target miRNAs in colorectal tumour (n = 35) and normal (n = 39) tissues. Boxplots depict median lines, interquartile-range boxes and outliers (*). Error bar represent range of values. Relative expression of tumour-suppressor miRNAs: (a) miR-143 and (b) miR-145 between colorectal tumour and normal tissues normalised to different reference genes with p values indicated. The use of the two most stable reference genes: miR-16 and miR-345 detected significant dysregulation of both miRNAs between colorectal tumour and normal tissues. The discovery of miRNAs as crucial regulators of gene expression has resulted in the rapid expansion of understanding of gene regulation in normal development and disease. Previously, it was demonstrated that miRNA expression profiles may be more accurate in disease classification than mRNA expression profiles . However, accurate and reliable interpretation of RT-qPCR results depends heavily on the use of suitable reference genes for normalisation to eliminate or minimise non-biological variation between test samples. While reference genes for mRNA RT-qPCR studies have been well-established, few miRNA RT-qPCR studies have detailed the validation of reference genes for normalisation to date. Rigorous normalisation of miRNA data may be more critical than that of other RNA functional classes . Indeed, their capability to regulate multiple gene targets within the same pathway may amplify their biological effects , hence small changes in miRNA expression may be biologically and clinically significant. Davoren et al. reported the first systematic assessments of candidate reference genes for miRNA RT-qPCR analysis in breast cancer . To our knowledge, such assessment and validation of reference genes for CRC studies has not been reported. The two most commonly used normalisers U6 and 5S RNAs were shown to be the two least stable RNA species . The use of rRNAs as reference genes has been debated as they can be expressed at much greater levels than target RNAs resulting in difficulty quantitating a lowly expressed target RNA [20, 22]. Furthermore, rRNAs have been shown to be involved in apoptosis  and cancer . Lastly, it has been argued before that it's best to normalise genes with reference genes belonging to the same RNA class . Let-7a was used as a normaliser in CRC miRNA RT-qPCR studies [7, 10]. However, its tumour-suppressor role in CRC has been reported . In a previous study, miR-191 and miR-25 were identified as the most stable pair of normalisers across 13 distinct human tissue types including 5 pairs of colon tumour and adjacent normal tissues. However, when analysis was performed on an extended cohort of lung cancer and normal tissues, miR-17-5p and miR-24 were the best normalisers . This demonstrates the importance of validating suitable reference genes in a tissue-specific context. Suitable reference genes for colorectal tissue-specific studies needs to be further assessed as previous reports have demonstrated that a single universal reference gene for all tissue types is unlikely to exist [19–23]. This is the first report detailing identification and validation of suitable reference genes for normalisation of miRNA RT-qPCR in human colorectal tissues. We profiled the expression of 380 miRNAs (including U6 rRNA) on 20 colorectal tissues. A robust method using the mean expression value was used to identify the most stably expressed miRNAs: let-7a, miR-26a, miR-345, miR-425 and miR-454. Mean normalisation was previously shown to outperform other methods of normalisation in terms of better reduction of technical variation and more accurate appreciation of biological changes . Validation by RT-qPCR was subsequently carried out in a larger cohort of 74 tissues with assessment of three more candidate reference genes (miR-16, RNU48 and Z30) . Our initial validation step confirmed no difference in reference gene quantities between tumour and normal tissues, allowing subsequent use of NormFinder and geNorm as these models assume that reference genes are not differentially expressed between experimental groups. Equivalent expression of reference genes between tumour and normal tissues was then confirmed using a fold change cut-off of 3 . Both NormFinder and geNorm identified miR-16 and miR-345 as the most stable normalisers. The five most stably expressed miRNAs in the TaqMan array card dataset of stage II tumours remained stably expressed when a larger cohort of variable disease stages was evaluated. This suggests that true reference genes are non-functional in the disease process, and should remain stably expressed throughout all stages, grades and subtypes. As evident from our results, inappropriate use of reference genes can significantly alter the results of target miRNAs quantitation. With the use of the best combination of reference genes (miR-16 and miR-345), significant dysregulation of all four target miRNAs (miR-21, miR-31, miR-143 and miR-145) was detected. These target miRNAs have repeatedly been shown to be dysregulated in CRC in previous studies. However, despite a relatively large sample size, when inappropriate reference genes were used for normalisation, a true biological difference in expression between tumour and normal was not detected. Even though miR-345 and miR-454 detected significant difference between tumour and normal tissues when used alone as a reference gene, geNorm analysis identified them as only the third and the fifth most stably expressed genes. The p values of the differential expression of the four target miRNAs between tumour and normal tissues were slightly lower when using the miR-16/miR-345 combination in most instances, which could prove significant in a small scale study. Furthermore, previous studies have reported that the use of more than one reference genes increases the accuracy of quantitation compared to the use of a single reference gene [22, 32]. The results of our study have important implications for CRC translational research. The clinical and pathologically diverse nature of the tissues used in this study should be of interest to a broad spectrum of the CRC research community. While it may not be feasible due to cost and sample availability, the stability of the top six most stably expressed miRNAs in colorectal tissues (let-7a, miR-16, miR-26a, miR-345, miR-425 and miR454) should be assessed to determine the most appropriate normalisers within each study as patient and tumour characteristics may vary between different study cohorts. Furthermore, with evidence to suggest that miRNA expression in formalin-fixed paraffin-embedded (FFPE) tissue samples remains relatively stable and consistent with that in fresh-frozen samples , and that reference miRNA stabilities are extremely consistent between the two tissue sources procured and processed independently of one another , the reference genes identified in this study may be useful for miRNA RT-qPCR study in FFPE colorectal tissues. This study also demonstrated that the use of the mean expression value is a useful means of identifying stable reference genes in high-throughput miRNA profiling studies, and the findings were confirmed to be robust after external validation. The authors gratefully acknowledge Ms Emer Hennessy and Ms Catherine Curran for continued technical assistance and for curation of the Department of Surgery BioBank, NUI Galway. KHC carried out colorectal tissue acquisition, TaqMan array card experiments, RT-qPCR assays, statistical analysis and drafted the manuscript. JV and PM were responsible for high-throughput TaqMan array card data analysis and identification of candidate reference genes using the mean expression value strategy. NM conceived, designed, supervised the study and helped to draft the manuscript. MJK participated throughout the study and critically reviewed the manuscript. All authors read and approved the final manuscript.